Twelve months of pure CORE adrenaline. A perfect Christmas gift for your best friend - or yourself! 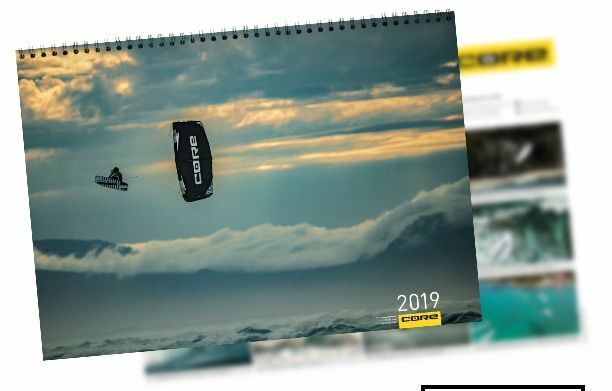 Order the new 2019 CORE calendar with 12 breathtaking moments, amazing backdrops, and nonstop action! Created for those who need some inspiration between sessions. And, possibly, a wall adornment that may never come down. Packed with extreme kiteloops, sublime wave riding and radical freestyle tricks, our latest calendar captures our best team riders in spectacular locales. This premium quality 59,4 x 42cm wall calendar is guaranteed to deliver kiters and soon-to-be kiters stoke and motivation all year. Order yours now!